Because when you can use an Emperor’s New Groove gif, why wouldn’t you? So the last two weeks were insanity, but also awesomeness. 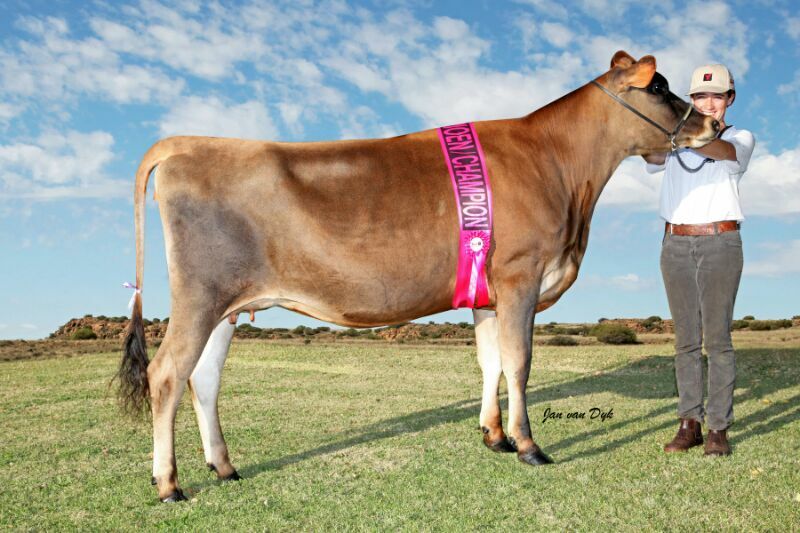 We took a truckload of Jerseys to Bloemfontein and my pet prized heifer was Northern Champion Jersey Heifer. She deserved it. We slept in the horsebox, which was awesome but cold, and I came home sick with flu. Last week Wednesday I decided I was all better just because I didn’t feel like dying when I was in bed, and nearly repeated that rather embarrassing incident last year when the Mutterer had to scrape my unconscious body out from under a horse’s feet. Whereupon I stayed in bed some more, and only actually got to climb on my horses for real again this afternoon. Arwen was fantastic. I changed our jumps a little bit, putting up a 1.00m (3′ 3″) vertical, a Swedish oxer that was around 80-85cm (2′ 9″) in the middle, and a little skinny that was more kind of emaciated. (This was achieved by making a stack of tyres, three high and two wide, so it was around 65cm or 2′ 3″). Arwen had jumped the vertical before, but we’d had a couple of stops at it mostly due to the height. Today she was awesome and popped over like no big deal. The Swedish oxer gave her pause for thought a few times, once again mostly because of me. She’s honest that way – she stops when I mess up but jumps every single time when I do my job. So when I got my act together she jumped the oxer just fine. The skinny gave her pause for thought because she wasn’t sure that we were supposed to jump it. She kept steering out, not with a reluctant sort of attitude but giving me the impression that she was thinking “Wow, stupid human, let’s not crash into the tyres, shall we?” Eventually I insisted that I did want to jump it and she said “Ooooh why didn’t you say so?” and popped over. Because she drifts, it was a bit of a sticky point and we ran out a few times before she gave me some good efforts from the trot and canter, and I called it a day. 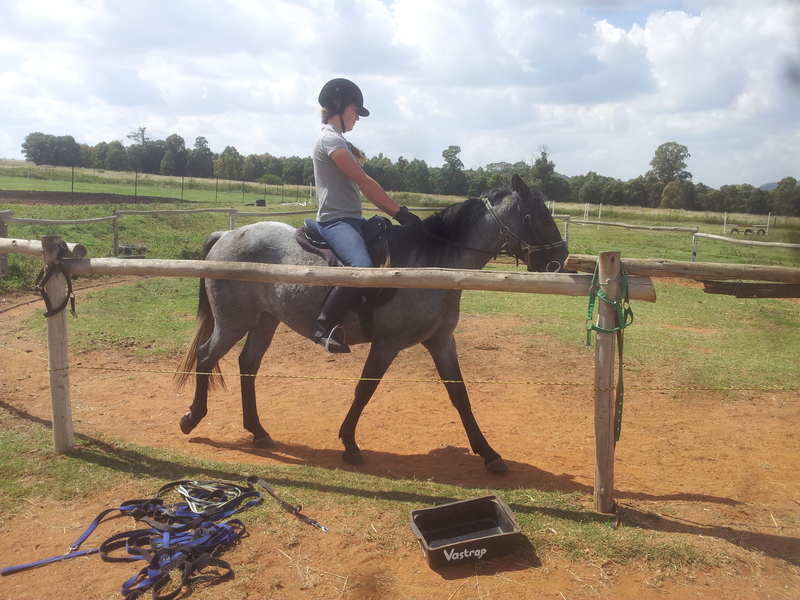 Next I rode this adorable 13.1hh pony that I have to back for some kids. He was easy enough to back but doesn’t have any brakes to speak of, mostly because he has some awful wolf teeth. For now I’m schooling him in a halter and he’s actually pretty sweet. He’s a very loving little pony. Interestingly enough he seems to have a goodly dose of Basuto blood, a breed that is near to my heart. The Basuto originates in the mountains of Lesotho and is renowned for its toughness, stamina, hardiness and amazing hooves, characteristics that it passed on when it was crossed with the Arabian and Boerperd to produce my beloved Nooitgedachters. First ride. Look how tall I am! I lunged Vastrap for 10 minutes or so because he hadn’t been ridden in two weeks, but he was an angel to catch (he can be skittish about that) and was his usual saintly self on the lunge, so I didn’t even mount him myself before putting Mom on and taking them for walkies. Vastrap has begun to put on some weight and muscle tone. He’s beautiful. His personality has also started to blossom; he no longer has that hunted look about him, except sometimes under saddle. Mom’s rides are doing him the world of good because she doesn’t put any pressure on him, and he needs that. I didn’t have a lot of time for Magic, but I put him in the ring and “free lunged” him. This, in Magic language, means standing in the middle for 10 minutes and not doing anything very much while Magic tears around at a terrifying pace, enjoying himself. Normally he’s superb to free lunge, but he really had ants in his pants today, so I decided against arguing with him and just let him run until his brain came back. Then we had some laps of beautiful relaxed canter and practiced some transitions on voice commands. Magic is excellent with voice commands. I think he uses his sense of hearing a vast amount. He’s probably my most vocal horse, and he responds instantaneously to voice commands; scary noises frighten him a lot more quickly than anything else does. My voice also soothes him an enormous amount when he’s nervous. It’s a good thing he’s not a dressage horse or one of our most important lines of communication would be against the rules. Lastly I took Professor X for a walk. We’ve graduated to taking little hikes around the homestead; I take the precaution of a lunging line in case he freaks out and rears (I’ve had an 11hh pony come down on my empty head and that was bad enough), but I haven’t needed it yet. He does like me to approach a scary object and touch it with him standing about 10m away on the end of the line. Once I’ve touched it, it’s apparently okay. He’s extremely spooky but, most importantly, very considerate of my personal space. He doesn’t run over me even when he’s really frightened or pulling for home. In fact, one day when Thunder and Flare decided to come running up at about 100kph, Exavior understandably shied sideways towards me. Mid-leap I could see him think, “Oh, sugar!” and then he made a valiant effort and managed to miss me by a comfortable distance. With a horse his size, this is immensely important, so I’m pleased that my drilling has paid off. He’s kind of a pain about his head when I put his halter on, though. He stands with his nose on the floor and I have to bend over to buckle it. Not too bad for a colt whose ears you couldn’t touch six months ago. I love him so much. Glory to the beloved King.